We sleep for a third of our lifetimes. Blinds set the mood in our bedrooms. Too much light, your beauty sleep and privacy will be compromised; too little light and the versatility of your bedroom will be restricted. Factors to consider when choosing bedroom blinds include natural light, privacy, versatility, and energy efficiency among others. This article will give you the best blinds suitable for bedrooms according to your specific requirements. If a slight glimmer of light stutters you from your beauty sleep, then you will need to blackout the room. Blackout blinds are ideal for a person who needs to have the bedroom as dark as possible. Blackout blinds use a cassette to cover the rollers to block out all light from the outside. Blackout blinds assure the maximum degree of privacy. If you are looking for energy efficiency, then Duette blinds are the ideal candidate. Along with necessary insulation, you get through privacy. The Duette blinds have fabric materials that go all the way up and down the window. The shades also cover the sides so that not even a glimmer of light vessel pass through when you are enjoying your Zzz’s. If you need a little natural light during the day, then choose the top down option of Duette blinds. The blinds cover the bottom section of the window, but the top part will remain open to allow for natural light into the room. Duette blinds do a perfect job of reinforcing your bedroom’s privacy. Roman shades offer a superb light block, thanks to their fabric materials. With the light blocking nature of these binds, you will not have to worry about prying eye from the ousted- your privacy will be assured. If you need to convert your bedroom into a yoga room during the day, you can easily hunch them to the top, and back down again when you need to sleep at night. Vertical blinds are more of light filters. They are ideal if you need to dim the room while allowing in a bit of natural light at the same time. A little amount of light can pass through the gaps in the fabric strips, but privacy is assured. Just like with the vertical blinds, wooden Venetian blinds allow in a small amount of natural light through the gaps between the strips. They are ideal if you need to maintain the privacy of your room while at the same time making use of natural light for activities such as reading. 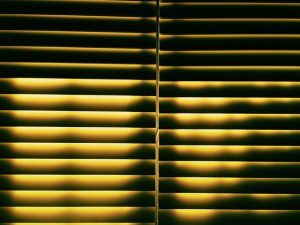 There are different types of blinds suitable for bedrooms: Blackout Blinds blackout all the light from outside, Duette Blinds provide total blackout plus insulation, Roman Blinds offer flexible light filtering, while Vertical Blinds and Venetian Blinds function well as room dimming blinds offering daytime bedroom versatility.